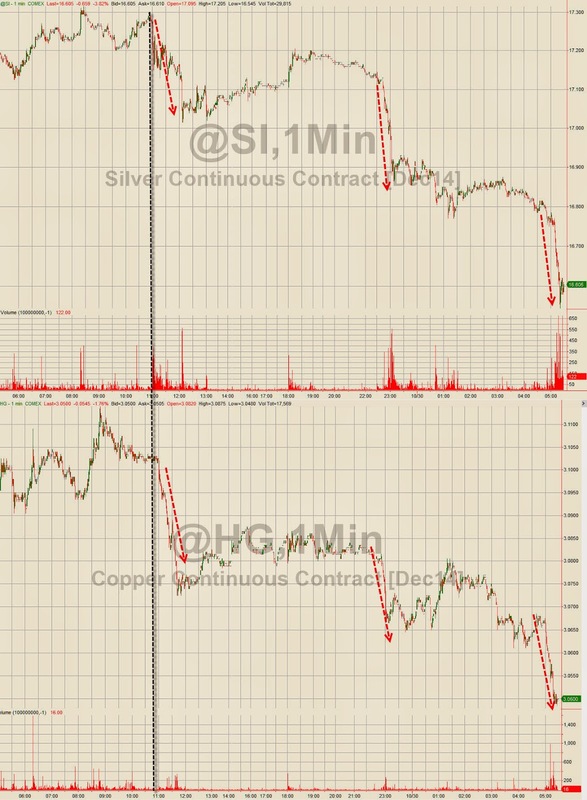 One of the toughest decisions ever..
"The last days for precious metals miners have been just shocking. 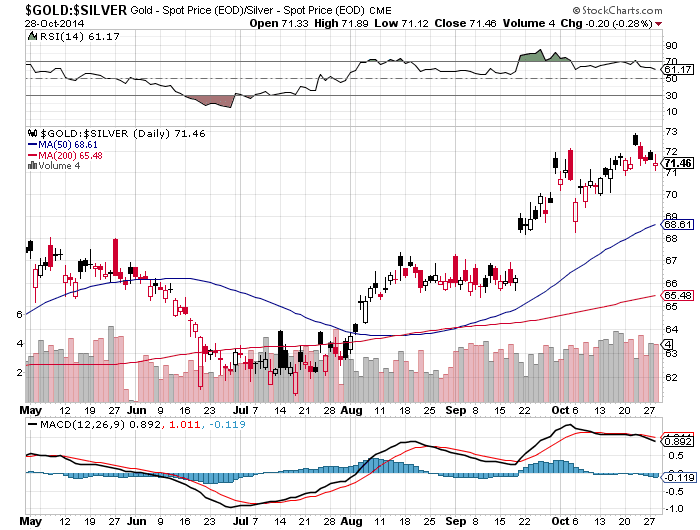 The most important gold and silver miner indices and ETFs broke their support lines and hit new multi-year lows. 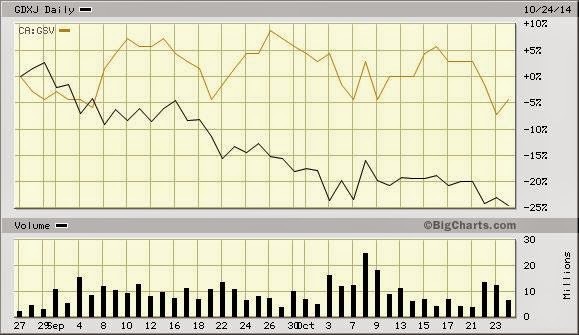 Just imagine that majors and multi-billion dollar companies like Yamana Gold and Goldcorp had double digits losses during the last trading session. "I had to liquidate the whole portfolio today to protect my subscribers, which is my responsibility. The market letter is owned by the publishing house and they have special risk and money management rules. The losses during the last weeks were so big for many subscribers that I was forced to react, which lead to complete, temporary liquidation of all stocks in the market letter. One of the toughest decisions in my career—to dump some of the best-in-class stocks at multi-year lows with depressed sentiment when, fundamentally, nothing has changed. But the market can be just brutal and it isn't smart to fight against all odds. 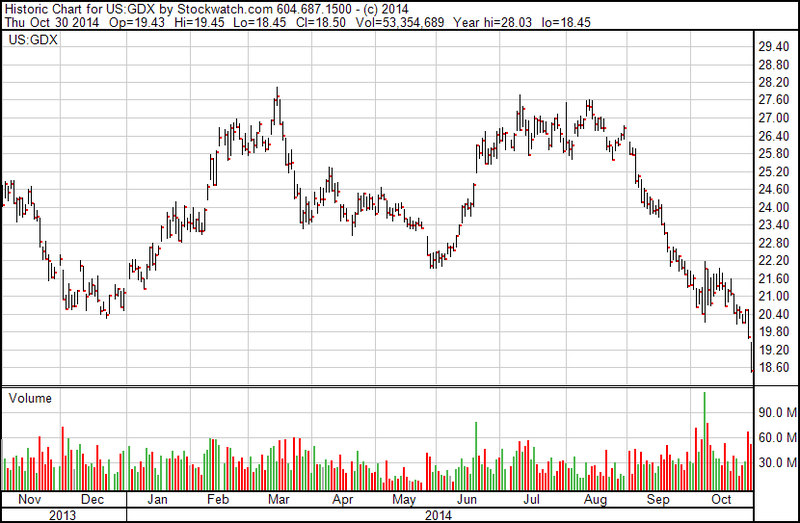 "The miners are clearly anticipating that Gold will break through the crucial support at $1,180/Oz. As always, I have to deal with probabilities here. Last week I mentioned in the interview with The Gold Report that I see a 50% possibility that Gold will fall to $1,050-1,000/Oz; now the possibility is above 75%. When gold will make this panic move and fall to 1,000 bucks, it's obvious that we'll see total capitulation in the miners space, which could have started today. "Of course, I plan to buy gold miners again when the dust has settled and we see something like a bottom and a bottom-building process. At the moment, I have to deal with the potential for further blood baths as I can't see lights in the end of the tunnel yet." Die größten und wichtigsten Gold- und Silberminen-Indizes durchbrechen in den letzten Tagen ihre 52-Wochen- und Mehrjahrestiefstände, was die Talfahrt im Edelmetall-Minensektor beschleunigt. Die Goldminen antizipieren bereits den nächsten Crash im Goldpreis, der bei einem Durchbruch der Marke von 1.180 USD/Oz (Dreifachboden während der letzten 16 Monate) immer wahrscheinlicher wird. Die aktuelle Crash-Phase kann unkommentiert stehen gelassen werden. Der Sell-Off bei den Minen erreicht erneut historische Ausmaße. Die totale Kapitulationsphase hat begonnen..
How the futures markets conspire to keep commodity prices down with paper and keep the rich nations supplied at the expense of the poorer ones. I am indebted to Mineweb reader Dr. Fraser Murrell from Melbourne for some thought provoking comments on how the world’s futures markets – notably COMEX and NYMEX – are instrumental in keeping commodity prices down to the advantage of first world nations at the expense of their poorer brethren who provide most of the world’s supplies. The views are particularly apposite with regard to the principal precious metals, gold and silver, and perhaps even more so in the platinum market where prices are currently being kept below the true cost of production. 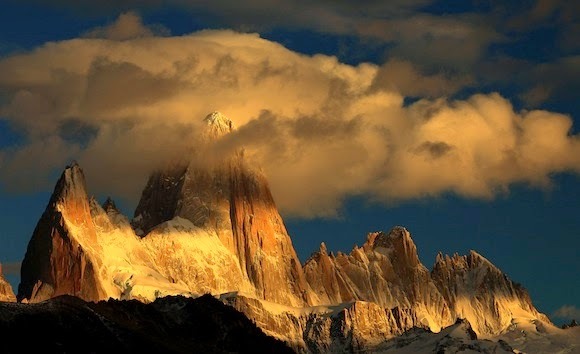 This, in some specific cases, may be backed up by the threat of force and/or sanctions if the producing nations do not comply, although this is perhaps not the case in respect of the precious metals, but certainly has been seen with respect to oil and gas producing nations. Murrell goes much further in his treatise, some of which we find hard to agree with, but the basic futures market scenario certainly strikes a chord. He thus notes further: “The price of these commodities contracts is predominantly set by the CME group on COMEX and NYMEX in America, which in turn are only rarely settled by physical delivery, with most contracts being rolled over from month to month. Taking this scenario further, Murrell comments that it is in the interest of the Western consuming nations to set these commodity prices as low as possible and, by virtue of their usage of the futures markets, to do this they are in effect corrupting market supply/demand and pricing basics. They can thus acquire the supplies they need, while setting a price that suits them through the futures markets and print out of thin air all the currency needed to pay for them. Meanwhile, the actual producing countries are thus forced to accept prices for their products that may even be below the cost of production due to the ‘market price’ set by the futures markets and then in exchange just receive potentially worthless paper which they will warehouse as currency reserves. Murrell takes the overall West-favouring scenario a step further by pointing out that these currency reserves are necessary for these countries to protect their own currencies in the light of ever continuing attacks on product pricing via the same futures markets. This does not only keep commodity prices low for the consuming nations, but also reduces developing world tax revenues thus perpetuating poverty in those countries. Now maybe some of this is a little over the top, but there has to be a strong element of truth in the impact of the futures markets on commodity pricing – whether this is one of the less-appetising facets of the capitalist system as practiced by the bankers and financial institutions, or whether this is an ongoing result of great game politics whereby the strong continue to dominate the weak, is perhaps rather more open to question. Murrell goes on to cite South Africa’s platinum industry as a great example of how this all pans out. As the producer of around 70% or more of the world’s platinum – a vital metal in catalysis and in environmental pollution control – it thus has a virtual monopoly of the metal’s production and should thus perhaps, in theory, be able to set the price it sells at. Yet at a current platinum price of around $1 250 an ounce, many of South Africa’s platinum mines are producing and selling metal at below the true cost of production – which Murrell puts at nearer $2 000 an ounce. Murrell reckons that the annual demand for platinum is around 8 million ounces (and increasing), while the annual mine supply is only around 6 million ounces (and decreasing), thus suggesting a severe deficit (supposedly) made up from stockpiles and recycling. Thus, in his opinion, quoted platinum prices are actually meaningless because the market is thus no way a two-way affair needed for market balance – a process which he describes as an ‘outrageous scam’. Looking at the market for physical platinum the amount registered for sale on NYMEX is only around 50 000 ounces, thus around 1/160th of global annual demand meaning that the price is controlled by the ‘manipulators’ on the basis of a minimal amount of physical metal, and at virtually no cost. Of course, there are huge parallels in terms of futures prices driving the physical price markets for both gold and silver with virtually no relation to market fundamentals. Murrell reckons that US government policy is at the root of the ‘manipulation’ and the body set up to regulate the commodities markets, the CFTC, is thus complicit. While some of Murrell’s arguments are perhaps open to question and some of the points he makes in a long communication to Mineweb are perhaps prone to some exaggeration in our view, his basic premise that commodity prices are driven by the futures markets and massive paper transactions, all to the advantage of the consuming nations and with no relation to physical supply and demand, do stand out as being wholly plausible.. 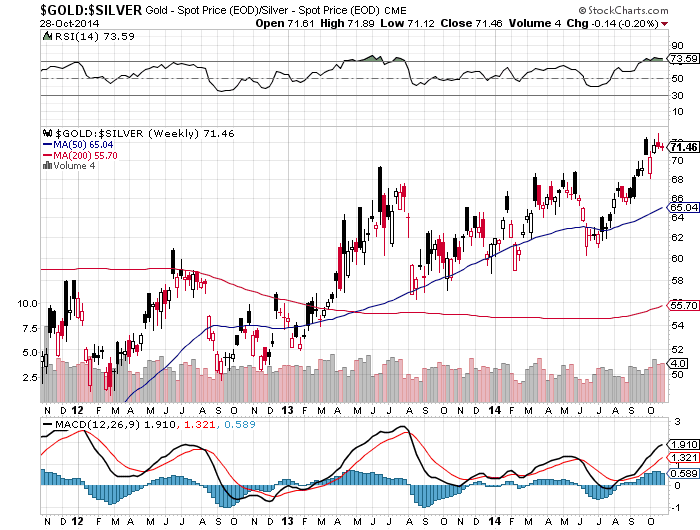 The not so great debate – Is gold manipulated or not? Holter expresses his disappointment with the quality of the debate on gold manipulation at the New Orleans Investment Conference. I attended the New Orleans Investment Conference this past week as the guest of Gold Anti-Trust Action Committee’s (GATA) Bill Murphy and Chris Powell for which I am highly grateful. There were many good and thoughtful speakers. I specifically wanted to attend this conference for two reasons; Alan Greenspan (Mr. Magoo) was a keynote speaker and I not so much wanted to hear what he had to say but, more importantly, how he answered audience questions..
- Pure Gold Mining (TSX-V:PGM): Neue high-grade Bohrergebnisse vom Madsen Gold-Projekt im Red Lake District in Ontario, Kanada. - Corvus Gold (TSX:KOR): Neue, starke high-grade Gold-Discovery auf dem North Bullfrog-Projekt im US-Goldminenstaat Nr. 1 in Nevada. Im Hinblick auf die Gehalte und Dicke der Mineralisierungen sind die letzten Treffer die besten, die bis zu diesem Zeitpunkt erzielt wurden. - Columbus Gold (TSX-V:CGT): Weitere solide Infill-Bohrergebnisse vom laufenden Explorationsprogramm auf dem Montagne d'Or-Vorkommen (Paul Isnard-Projekt) in Französisch Guyana, die alle auf oberflächennahe Gold-Mineralisierungen trafen und eine gute Kontinuität der idenftifizierten Goldzonen bestätigen. - ATAC Resources (TSX-V:ATC): Discovery von weiteren, aussichtsreichen Explorationszielen in der Anubis Area, Teil des riesigen Rackla-Projekts im kanadischen Yukon. Weiterhin lässt sich ein stabiler Aufwärtstrend im Gold:Silver-Ratio (GSR) feststellen. Silber zeigt auch in den letzten Wochen Schwäche im Vergleich zum Goldpreis. Erst wenn Silber den Bereich zwischen und 18-19 USD/Oz erneut überwinden kann, ist mit der Chance auf einen nachhaltigen Trendwechsel zu rechnen. Und danach sieht es Stand heute definitiv nicht aus. Unterhalb der 52-Wochen- und Mehrjahres-Tiefstände wäre 16 USD/Oz das nächste Ziel beim Silberpreis. Dieser Verlauf würde dann ein Anstieg des GSRs Richtung 80 wahrscheinlich machen. Dann wäre es bis zu den historischen Hochständen nicht mehr weit..
Few junior mining companies in the world today have an opportunity like Pure Gold Mining (PGM.TSXV), first covered by Lawrence in the July edition of this newsletter. Pure Gold is an approx. 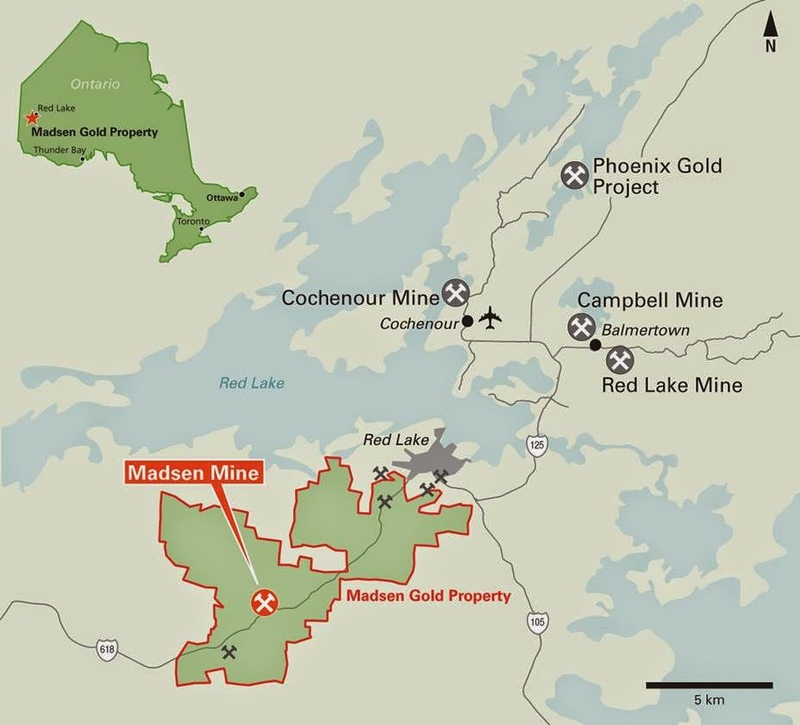 $30 million market cap company that owns the historic Madsen mine in the prolific Red Lake gold district of Ontario, Goldcorp’s backyard, that is fully permitted, has a mill on site, and 1.2 million ounces of high-grade gold..
"Mark O'Dea is also a director of Pure Gold Mining Inc. (PGM:TSX.V), which has consolidated a large land package in Ontario's Red Lake District, the highest-grade gold mining district in the world. 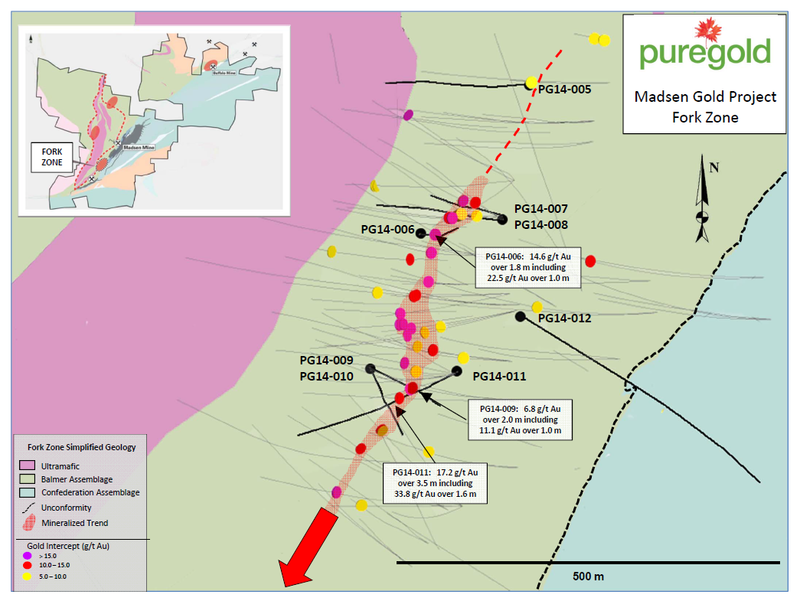 Pure Gold now controls 100% of the Madsen gold project, which contains a high-grade gold mine with historic production of 2 Moz. 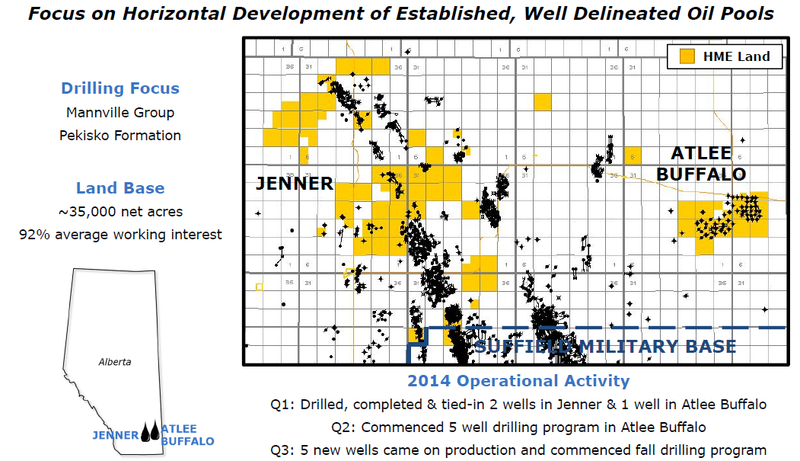 I see the potential to discover a high-grade, multimillion-ounce resource in the next few years. This could lead to a takeover by a larger gold producer, such as Goldcorp, the major Red Lake player.."
VANCOUVER, B.C. – Pure Gold Mining Inc. (TSX-V; PGM) (“Pure Gold” or the “Company”) is pleased to provide an update regarding the ongoing exploration program at its 100% owned Madsen Gold Project in the prolific Red Lake gold district of northwest Ontario. 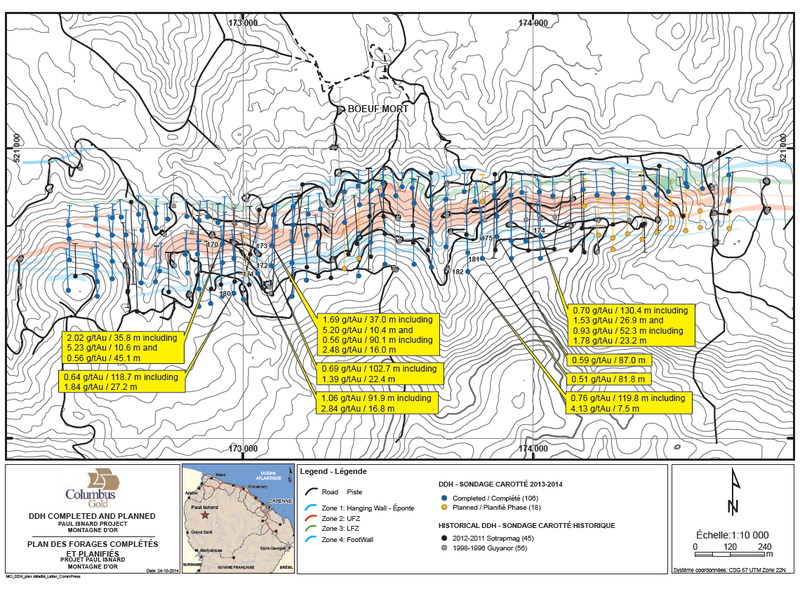 The $4.0 million exploration program, which includes 9,000 metres of diamond drilling, is designed to test and expand the current mineral resources1, while concurrently developing and drill testing high-grade, 8 Zone-style targets through ongoing evaluation of the large historic database..
Columbus Gold (TSX-V:CGT) publizierte heute weitere sehenswerte Bohrerfolge vom laufenden Explorationsprogramm auf dem Multi-Millionen Goldunzen-Projekt Paul Isnard. Das Flaggschiff der solide aufgestellten Juniorfirma wird zusammen mit dem russischen Goldkonzern Nordgold (LSE:NORD) entwickelt. Die jüngsten Bohrergebnisse überzeugen mit ordentlichen Goldgehalten auf soliden Längen, attraktiver Oberflächennähe und einer guten Kontinuität. So stehen die Chancen bis dato sehr gut, dass Columbus sowohl die Qualität, als auch die Quantität der aktuellen Gold-Ressourcen erhöhen kann. Es bleiben weiterhin drei Bohrgeräte aktiv. Columbus visiert an, das umfassende Bohrprogramm bis Mitte November komplett fertigstellen zu können. Das nächste NI 43-101 konforme Ressourcen-Update wird laut Fahrplan im Januar 2015 erscheinen und soll die Grundlage für die darauffolgende PEA darstellen (Q1 2015). VANCOUVER, BC--(Marketwired - October 28, 2014) - Columbus Gold Corporation (TSX VENTURE: CGT) (OTCQX: CBGDF) ("Columbus Gold") is pleased to announce drill results from an additional 9 holes from its Phase II resource development diamond drilling campaign currently underway at its 100%-owned Montagne d'Or gold deposit, Paul Isnard Project, in French Guiana. To date 106 holes (106 to 203 and 206 to 213) have been completed, for a total of 20,750 meters. "This latest round of results has demonstrated good continuity of the principal UFZ zone within the west-central and east-central sections of the deposit. 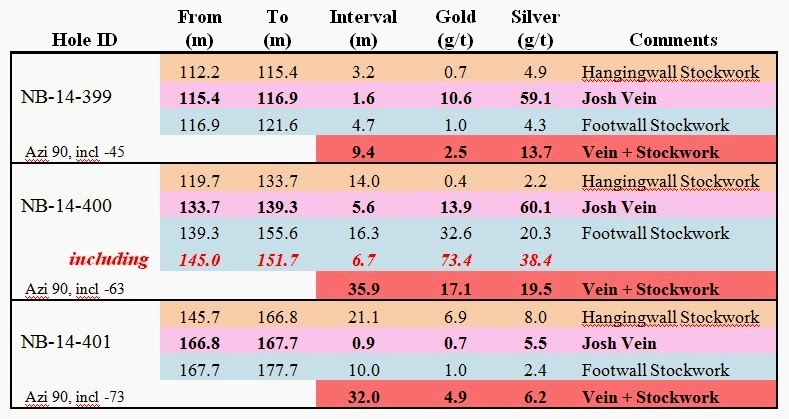 All holes returned thick gold mineralized intervals within 200 metres from surface" commented Robert F. Giustra, Chairman and CEO of Columbus Gold. "With three drill rigs operating we are well on our way to finalizing the current drill program in early November and targeting completion of a new resource estimate in January.."
"..TGR: Which companies do you like in South America? I met Columbus' CEO Robert Giustra in Paris this year. He is committed to dramatic and dynamic expansion. The company will finalize an extensive drilling program this quarter, which should lead to an increase in the quantity and quality of identified gold resources. A preliminary economic assessment (PEA) is scheduled for Q1/15. 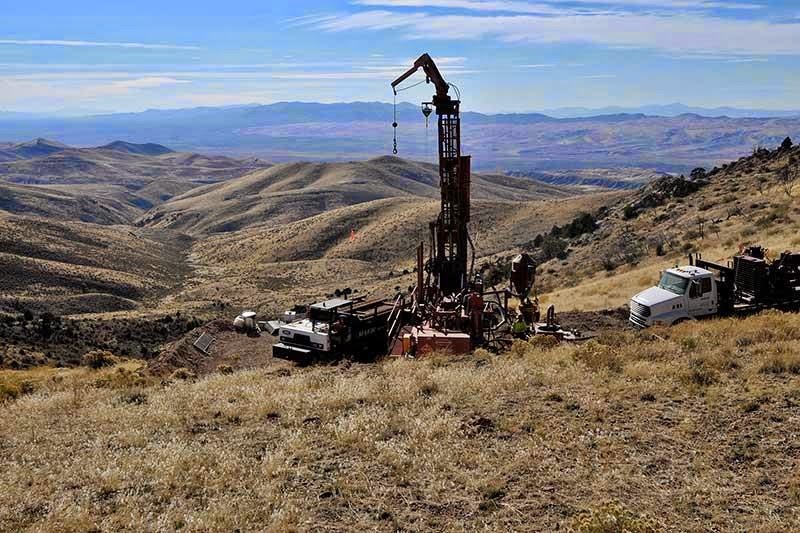 In addition, Columbus will undertake a significant drilling program at its Eastside gold and silver project in Nevada. This could become a company-maker in its own right..."
Nächste Meilensteinnews für Columbus Gold, dem federführenden Explorer und Developer der Multi-Millionen Goldunzen schweren Paul Isnard Discovery..
Der Aktienkurs des relativ unbekannten, russischen Goldproduzenten Nordgold (LSE:NORD) steht wie die meisten Kurse der Goldkonzerne aktuell stark unter Druck, obwohl die Gesellschaft starke Fundamentaldaten und Fortschritte vorweisen kann..
Oliver Gross: This kind of inverse relationship between gold and the broader equity markets isn't really new. 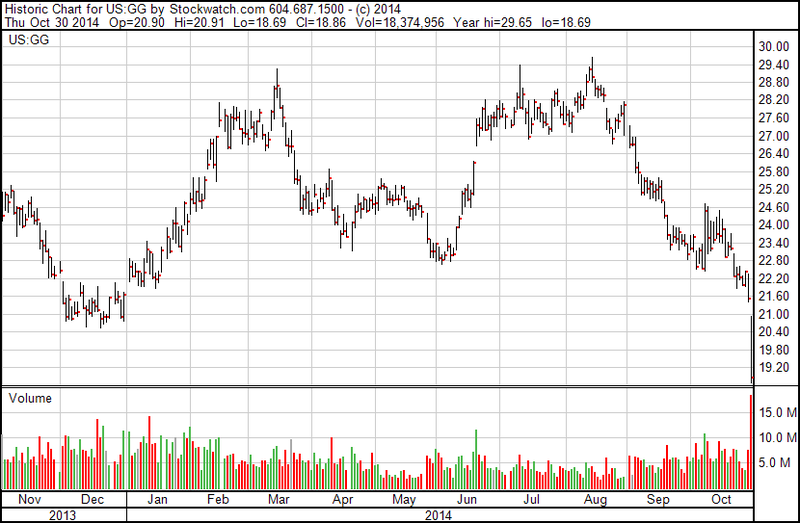 It has been observed since fall 2011, when the price of gold peaked. Since then, gold has fallen more than 35%, while the S&P 500 has risen 70%..
Gold Standard Ventures' (TSX-V:GSV, AMEX: GSV) CEO und Präsident, Jonathan Awde, kaufte in den letzten Tagen weitere GSV-Aktien am offenen Markt nach und baut seine Beteiligungen auf jetzt knapp 1 Millionen Aktien aus. Awde nutzt damit die jüngsten Crash im Junior-Goldminen-Sektor erneut aus, um nahe den Jahrestiefständen weitere Aktien einzusammeln. Neben seinen Aktienbeständen hält Awde mehr als 1,3 Mio. GSV-Optionen, wobei die meisten davon nicht im Geld sind. Das überzeugte Management und Board inkl. Family & Friends halten mehr als 15% an der aussichtsreichen Gold-Gesellschaft. 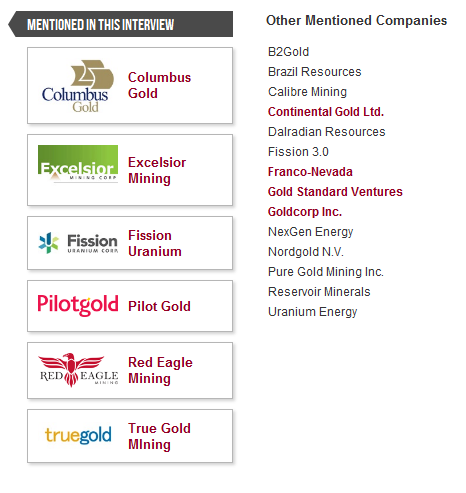 "TGR: Which Nevada gold companies are your favorites? OG: In Nevada, I like Gold Standard Ventures Corp. (GSV:TSX.V; GSV:NYSE) and its Railroad-Pinion gold project in Nevada. The company has successfully consolidated a large land package and proved close to 1.5 Moz in very lucrative, exposed oxide deposits. This deposit is open in multiple directions and is located in an active gold mining camp next to Newmont. This should be a straightforward heap-leach gold mine with low capital intensity, and represents another takeover target." Gold Standard kann in den letzten Wochen relative Stärke entfalten, was primär auf die starken Fundamentaldaten und Projektfortschritte zurück zuführen ist..
Trotz anspruchsvoller Marktlage treibt Hemisphere Energy sein Expansionsprogramm erfolgreich voran und kann sich auf seine wettbewerbsstarken Assets verlassen. Der kanadische Junior-Öl- & Gas-Produzent, Hemisphere Energy (TSX-V:HME, WKN: A0RM3S, ISIN: CA4236301020), steigert seine Förderzug zuletzt beträchtlich. Während im zweiten Quartal 2014 noch durchschnittlich 553 Barrel Öl-Äquivalent pro Tag (boe/d) produziert wurden, betrug die Produktion in den ersten zwei September-Wochen (letzter Stichtag) bereits 900 boe/d. Das entspricht einer sehenswerten Produktionssteigerung von mehr als 60% binnen weniger Monate. Und so blickt das Management natürlich sehr optimistisch auf die anstehenden Ergebnisse für das dritte Quartal 2014, welche den starken Wachstumskurs der profitablen Gesellschaft bestätigen werden. Spannend wird auf jeden Fall auch die Entwicklung des operativen Netbacks (ugs. Nettomarge O&G-Sektor), der im zweiten Quartal bei rund 40 USD pro BoE lag. Trotz der Einbrüche beim Öl- und Gaspreis während der letzten Wochen, sollte Hemisphere noch eine solide Marge erzielen können. Aktuell fokussiert sich Hemisphere auf die Projekt-Entwicklung und der darauffolgenden Produktions-Expansion der Atlee Buffalo-Liegenschaften im öl- und gasreichen, kanadischen Bundesstaat Alberta, der mit einer guten Infrastruktur und einer etablierten Förderregion punktet. So wurden im umfangreichen Sommerprogramm zum ersten Mal in der Firmen-Historie fünf Öl- und Gasbohrungen erfolgreich absolviert. In nicht einmal 12 Wochen wurde das Programm fertiggestellt, was eine eindrucksvolle Zeit ist. Seitdem wird aus den fünf neuen Quellen Öl- und Gas gefördert. Besonders bemerkenswert ist hierbei, dass die Produktionsrate der ersten sechs Bohrungen auf den Atlee Buffalo-Liegenschaften starke 60% höher ist, als in den Planungen angenommen. Aufgrund der hohen Kapitaleffizienz fielen gleichzeitig die Gesamtkosten dieser Bohrungen 10% unter die Budget-Prognosen, was weitere positive Effekte auf der Profitabilitäts- und Margen-Seite mit sich bringt. Auf Atlee Buffalo schätzt Hemisphere die förderbaren, ökonomischen Ressourcen pro Bohrung aktuell auf rund 100.000 boe, wobei hier noch kein weiteres Expansionspotential getestet wurde. Seitdem Hemisphere die Förderung auf Atlee Buffalo im Herbst 2013 gestartet hat, wurde die tägliche Fördermenge von 60 boe/d auf aktuell rund 520 boe/d massiv gesteigert. Eine gewaltige Förder-Expansion, die der wachstumshungrige Junior-Produzent hier binnen eines Jahres auf Atlee erzielt hat. Doch noch lange nicht sind die Expansios-Potentiale auf den großen und sehr aussichtsreichen Öl- und Gas-Liegenschaften ausgeschöpft. Hemisphere’s Expertenteam hat weitere 65 potentielle Bohrziele identifiziert, die sich ähnlich auszahlen könnten. Aus diesem Grund wurde bereits das nächste Produktionsexpansions-Programm gestartet. Das Herbstprogramm sieht vier weitere Horizontal-Bohrungen auf Atlee vor, sowie eine vertikale Test-Bohrung bei einem attraktiven Bohrziel auf den Jenner-Liegenschaften. Im Hinblick auf die starken Aussichten der fokussierten Projekte in Alberta lag es auf der Hand, dass Hemisphere bei erfolgreichen Bohrungen seine Liegenschafts-Interessen entsprechend erweitern wird, um sich bereits frühzeitig weitere, lukrative Projekt-Bohrziele für die Zukunft zu sichern. Und genau das wurde vom Management dann auch zielstrebig über die letzten Monate umgesetzt. Hemisphere hat seine Land-Positionen im Atlee Buffalo um signifikante 1.120 Hektar vergrößert, wobei die Firma eine Betriebsbeteiligung von ordentlichen 85% erwerben konnte. Doch nicht nur im operativen Geschäft läuft es beim kanadischen Juniorproduzenten gerade rund. Die Gesellschaft konnte einen weiteren versierten Experten für das Senior Management-Team gewinnen. Und so gab Hemisphere Anfang Oktober die Ernennung von Mr. Richard Wyne als neues Vorstandsmitglied bekannt, was die Qualität und Expertisen des Management-Teams nochmals erhöht. Denn Wyne bringt ein exzellentes Netzwerk mit, war in zahlreichen erfolgreichen Energie-Stories in den letzten 30 Jahren involviert und kann in einigen Firmen-Bereichen wertvolles Expertenwissen vorweisen. So kennt sich Wyne nicht nur im Öl- und Gasgeschäft sehr gut aus, sondern er weiß auch was Investoren und Buy Side Analysten von einem Junior-Produzenten im Energie-Segment erwarten und sehen wollen. Erwähnenswert ist an dieser Stelle, dass die ehrgeizigen Verantwortlichen überzeugte Langfrist-Investoren sind und mehr als 10% von Hemisphere halten. Ein solches Vertrauen aus der entscheidenden Führungsebene spricht definitiv für sich und sollte interessierte Anleger gewiss gefallen. Denn so steht die nachhaltige Generierung von Aktionärswerten nachvollziehbar komplett im Fokus. Fission Uranium (TSX:FCU) hält auf Patterson Lake South (PLS) eine eindrucksolle Trefferrate, die das nach wie vor bedeutende Explorations- und Discovery-Potential unterstreicht. Die Qualität der neusten Bohrergebnisse spricht einmal mehr Bände (u.a. 7,5 Meter mit weltklasse Urangehalten von knapp 25%!). Ende des Jahres steht die heiß erwartete, erste NI 43-101 konforme Ressourcen-Schätzung an, welche den nächsten großen Projektmeilenstein bei Fission Uranium widerspiegeln wird. Nach Vorlage einer substanzstarken Ressourcen-Schätzung sehen viele eine Übernahme kommen. Doch dies ist nur wahrscheinlich, wenn sich der Uran- und Juniormarkt stabilisiert. Denn teure Übernahmen plus die Finanzierung von neuen Uranminen können sich gerade nur ganz wenig Spieler überhaupt noch leisten. Vor allem wenn quasi alle Uranproduzenten aufgrund der niedrigen Preise de facto draufzahlen. 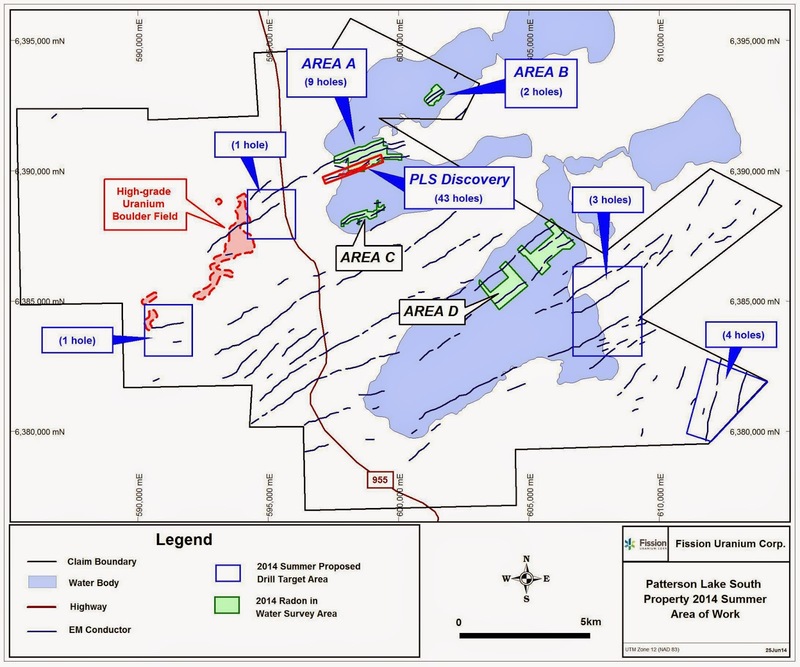 Event: Fission Uranium has announced yet another set of world class assay results from its Patterson Lake South project located in the southwestern corner of the Athabasca Basin. All 13 drill holes encountered strong mineralization at shallow depths. 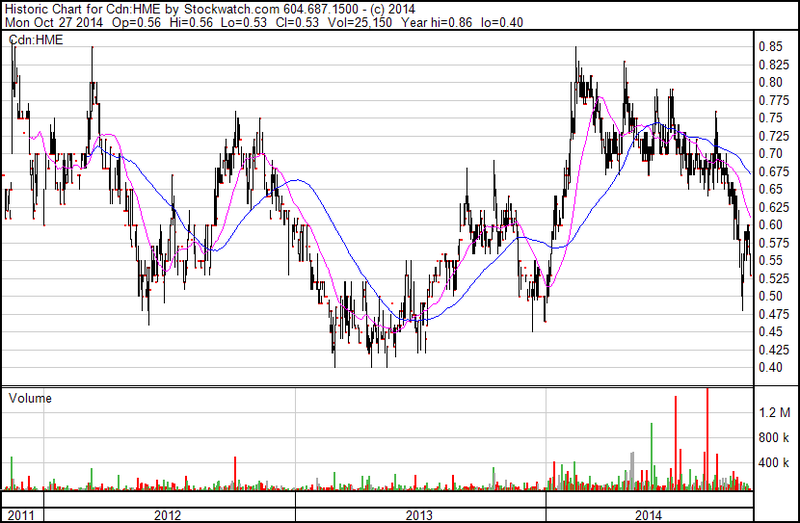 Bottom line: Positive – PLS continues to produce high grade uranium assays. Of note is the fact that the latest set of drill holes extends the R780 zone laterally to the north by 93m and to the south by about 38m. 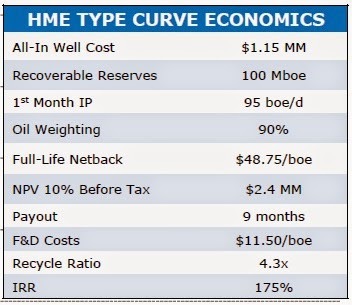 The expansion of the potential resource envelope further strengthens our belief that PLS will eventually be a 100M lbs. U3O8 resource at minimum. o This bodes well for additional upside as some of the best mineralized areas of the deposit are occurring outside the known mineralized boundaries. 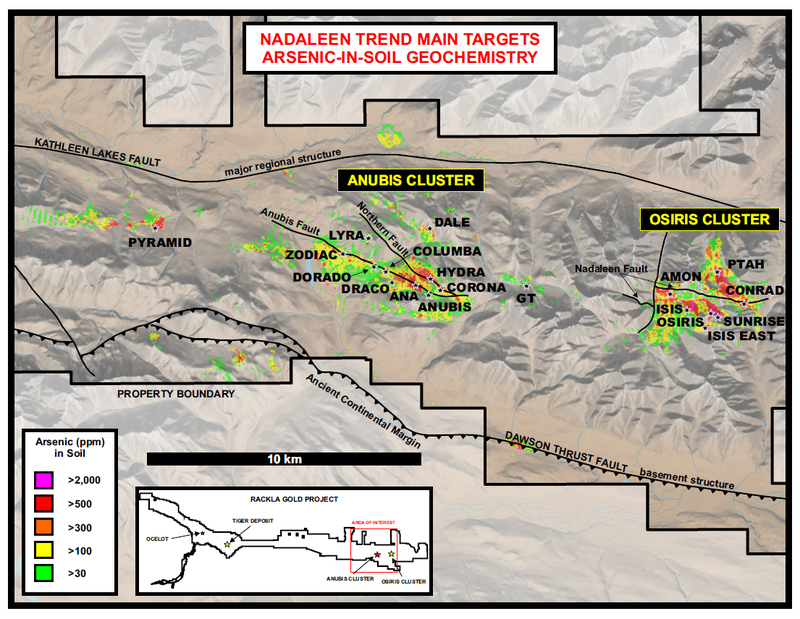 · Management notes that assay results from 18 zone delineation and 22 exploration holes are still pending. · As a result, our updated resource estimate has increased to 76.0M lbs. U3O8, which is up 3.7% from our prior estimate of 73.3M lbs. U3O8 at an average grade of 0.81% (unchanged). · We continue to be confident that Fission Uranium will ultimately contain a resource of over 100M lbs. and note that by the year’s end an initial resource for the PLS property will be announced. We expect an initial resource of between 50M – 70M lbs. o Given precedent uranium takeout transactions occurring at an average in-situ value of $9.28/lb., using a conservative $7.00/lb. multiple and assuming an ultimate resource of 100M lbs., we arrive at a $1.83/share valuation, which is 101% higher than FCU’s last close. § At our current resource estimate of 76M lbs. 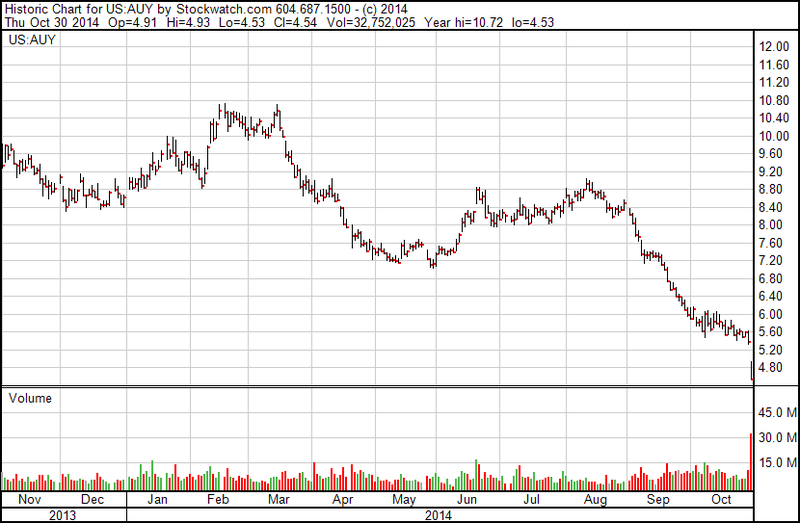 U3O8, the valuation using a $7.00/lb. 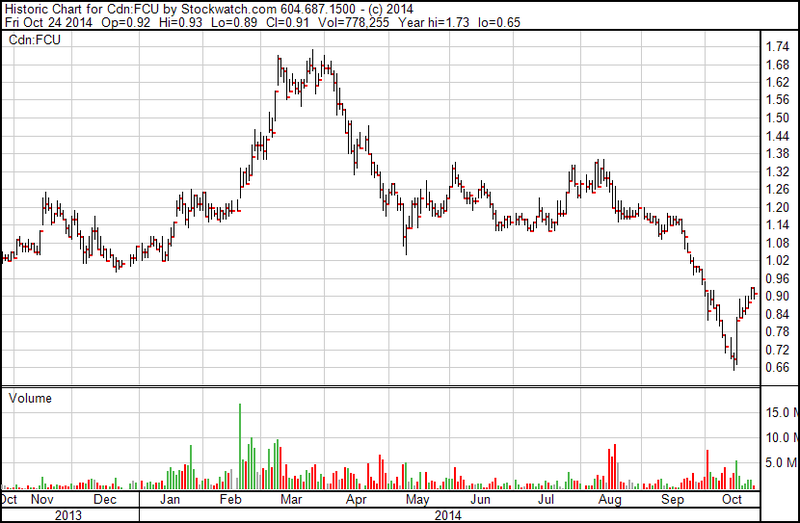 multiple is $1.39/share, or 52% above FCU’s last close. · FCU remains as one of our top picks in the uranium space. Brasiliansiche Rohstoffaktien gehen wie der brasilianische Gesamtmarkt pre-market massiv auf Tauchstation. Der Markt hatte sich eine andere Wahlentscheidung am Wochenende erhofft. So steht der Öl-Major und Multi-Milliardenkonzern Petrobras (NYE:PBR) vorbörslich mehr als 16% im Minus, was schon eine gewaltige Hausnummer ist. Der größte Rohstoffkonzern Südamerikas, Vale (NYE:VALE), steht nach den vorbörslichen Indikationen ebenfalls erheblich im Minus. So spricht alles für ein wahres Blutbad heute für Aktien mit der Heimatbörse in Brasilien.. The iShares MSCI Brazil Index ETF (NYSEARCA:EWZ) is lower by 9.5% premarket after President Rousseff narrowly won re-election over the weekend. In what is sure to be a major risk-off move for the Bovespa, and Latin American risk in general, moments ago the newswires blasted that in what was expected to be a very closely contested election, incumbent President Dilma Rousseff has 50.99% of valid votes vs 49.01% for challenger Aecio Neves with 95% of ballots counted, according to Brazil electoral court website..
Gold Standard kann in den letzten Wochen relative Stärke entfalten, was primär auf die starken Fundamentaldaten und Projektfortschritte zurück zuführen ist. Die kanadische Junior-Firma Gold Standard Ventures (TSX-V:GSV), die auf die Exploration und Entwicklung von aussichtsreichen Gold-Liegenschaften in Nevada spezialisiert ist, hält sich im Vergleich zum Goldminensektor in den letzten Woche wirklich gut. Während der Großteil der Goldminen extrem scharf korrigierte – Crash trifft es wohl besser – kann Gold Standard zumindest relative Stärke vorweisen, die in diesem Marktumfeld definitiv beachtlich ist. Am 10. September 2014 legte Gold Standard die erste erfolgreiche Ressourcen-Schätzung für das Hauptprojekt Pinion im ruhmreichen US-Bundesstaat Nevada vor, der größten Goldproduzenten-Region in Nordamerika. Die Ressource wurde auf insgesamt 1,45 Mio. Goldunzen beziffert, wobei sich rund 420.000 Goldunzen in der höher qualitativen M+I-Kategorie befinden. Die erste Ressourcen-Schätzung war ein solider Anfang unterstreicht die großen Potentiale des Projekts. Es ist ersichtlich, dass Gold Standard mit intensiven Ergänzungsbohrungen einen Großteil der Ressource in verlässlichere Qualitäts-Kategorien bekommen wird. Genau das ist der Plan des Managements. Auf sedar.com können Investoren nun den detaillierten NI 43-101 konformen Ressourcen-Report einsehen: http://goldstandardv.com/gold-standard-announces-filing-of-ni-43-101-technical-report-on-the-pinion-gold-deposit. Dieser Report wurde am 24. Oktober offiziell publiziert. Vor kurzer Zeit gab Gold Standard außerdem weitere positive Nachrichten von der Projekt-Front und den laufenden Explorationsprogrammen bekannt. Starke Ergebnisse von neuen Gesteinsproben an oberflächennahen Zonen führten dazu, dass Gold Standard sein aktuelles Explorations- und Bohrprogramm erweitern wird. Im nördlichen Teil des Pinion-Hauptvorkommens fand Gold Standard diese interessanten und aussichtsreichen Proben, die auf weitere, oberflächennahe Mineralisierungen mit oxidischem Gold hindeuten. Die jüngsten Gesteinsanalysen wurden im Rahmen eines umfassenden Proben-Programms erstellt, das im August 2014 von der Junior-Firma gestartet wurde. Einige visuelle Einblicke können Sie auf der Firmen-Homepage einsehen: http://goldstandardv.com/pinion-channel/. Aufgrund der erfreulichen Explorationsergebnisse hat sich Gold Standard für eine Erweiterung des Bohrprogramms entschieden. Ein drittes Bohrgerät wurde daher hinzugefügt und dieses wird sich auf die Exploration der Pinion North Zone fokussieren. Auf den Pinion-Liegenschaften läuft seit September ein 7.000 Meter-Bohrprogramm mit Hochdruck weiter. Ziel des Programms ist die Umwandlung von abgeleiteten Ressourcen in identifizierbare und verlässlichere Ressourcen-Kategorien (M+I), sowie weitere Tests des großen Explorationspotentials. Durch vielversprechende Expansionsbohrungen soll die potentielle Größe der Lagerstätte bedeutend vergrößert werden. Da die mineralisierten Goldzonen in vielen Richtungen offen stehen, stehen die Chancen hierfür ausgesprochen gut. Die Arbeitsprogramme im ruhmreichsten Goldminen-Bezirk in Nordamerika laufen bei der kanadischen Juniorgesellschaft auf Hochtouren..
Hierzu ein aktueller Beitrag von CEO.CA - Mein Kollege Tommy H. aus Vancouver hatte erst vor ein paar Tagen ein Gespräch mit Gold Standard's CEO John Awde, der diese Woche auf dem renommierten Denver Gold Forumsich und seine Story präsentierte..